Jennifer Savage, with the Ocean Conservancy, began a two-year shoreline monitoring project last week to record marine debris, including anything dragged into the sea by the March 2011 Japan tsunami. We took a winding, pretty trail through beach pines and sitka spruce, their feet draped in a lush, sun-speckled undulation of fern and salal, twin berry and huckleberry. The trail spilled us onto a steep slope of wavy sand dune, overlooking stabilized dune forest and active dunes. This is the Ma-l'el Dunes unit of the Humboldt Bay National Wildlife Refuge Complex, one of the most human-impact-free stretches of coastline in our region. Here, instead of a sea of invasive European beach grass, fat blades of native dune grass spring from the sea-facing slopes of sand. Somewhere down there, along the semi-remote shoreline, Savage, who works for the Ocean Conservancy, was about to set up a survey plot. Over the next two years she'll return to the plot once a month at low tide with a team of volunteers to record marine debris -- keeping a particular eye out for anything that might have been generated by the tsunami that devoured the north-east coast of Japan in March 2011. Yes, we know, many of you are freaked/excited about the prospect of stuff washing ashore from that tragic event. Will it be radioactive? Will it be unbearably terrible and sad -- will we see some of those 100 "sneakers with bones in them" that oceanographer Curt Ebbesmeyer just two weeks ago told an audience in Port Angeles, Wash., to expect? Maybe we'll find a soccer ball -- like the one that washed up on Middleton Island, in Alaska, and was traced back to a boy who lived in the tsunami zone. Or another Harley-Davidson -- like the one registered to Ikuo Yokoyama, who lost his home and several relatives in the tsunami. It washed ashore in British Columbia, in its styrofoam storage container. Perhaps a ghost vessel -- like the fishing boat, registered in the Fukushima Prefecture, found off the coast of British Columbia and, later, sunk so it wouldn't be a floating hazard. It's hard to say what might wash up on our shores from the tsunami, NOAA marine debris specialist Sherry Lippiatt told me by phone the day before I joined Savage in the field. NOAA has been modeling past wind and ocean current patterns since the March 11, 2011, event to develop an idea of how the tsunami marine debris might be traveling across the ocean. According to the model, increasing amounts of debris might start washing up on West Coast shores in 2013. But the model can only suggest possible scenarios, because nobody can predict future wind and ocean current patterns. In addition, when stuff does wash ashore, it's not easy to determine whether it was tsunami-generated, Lippiatt said, "because debris from Asia washes up all the time." Lippiatt's colleague, Dianna Parker, added that the Japanese government estimates that the tsunami washed 5 million tons of debris into the ocean, and that 70 percent of that immediately sank. "That left about 1.5 million tons floating," Parker said. "So that was more than a year ago, and this debris has been at the mercy of storms and weathering, and it sinks and breaks apart. And, then, our models show that the area where debris may have dispersed is roughly equal to three times the size of the lower 48 states. So, while a lot of people are obviously concerned about this issue -- we're concerned, and we want to make sure that we're ready for any scenario -- there is not this big mass of debris headed for the U.S."
It's doubtful it will be radioactive, because it was swept far out to sea before the Fukushima nuclear power plant released radioactive water, the NOAA debris-trackers said. But, said Lippiatt, beachgoers and shoreline debris surveyors should be cautious about handling certain debris, such as sharp things, or sealed casks or oil drums that might leak. The shoreline surveys will establish baseline data, showing what's already washing ashore. They also might detect whether more stuff is washing up post-tsunami, and perhaps reveal more about how debris traveled after that event. The growing excitement over tsunami debris, Lippiatt said, has increased public awareness about trash in the ocean and on beaches. So for NOAA, it seemed an opportune time for a new study, with a tsunami twist, to complement myriad other marine debris studies on and off shore. The data might help agencies plan their emergency responses to marine dumps from natural disasters. It also might shed light on the effectiveness of efforts to control everyday sources of marine debris -- the garbage that you and I are responsible for letting get into the ocean. At some monitoring sites, surveyors will record and pick up the trash they find each time, developing data on the rate of deposition of debris -- how much washes ashore over time. At other sites, surveyors will record the amount and types of debris -- glass, metal, rubber, plastic and so on -- but leave the debris in place. This data will show the density of debris on a particular site -- the "standing stock," as it were. Savage's team will be doing the standing stock survey at the plot near Ma-l'el Dunes. The site is ideal -- remote enough to reduce the occurrence of trash generated by beachgoers or town, but not so remote that it takes too long for volunteers to get to. And, there are no organized beach cleanups there -- which would skew the data. 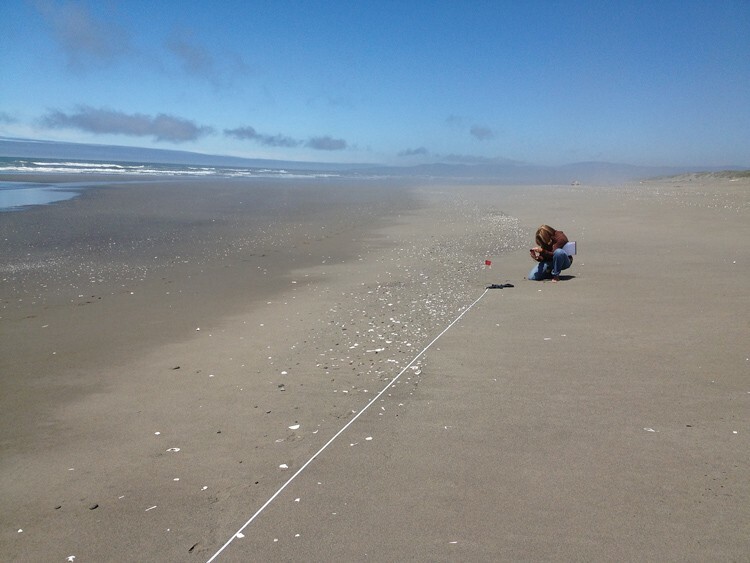 Standing on the waveslope last week, Savage looked at the GPS that NOAA sent her, noted the location in her notebook, then looped the end of the measuring wheel tape onto several long flagged pins and jabbed them into the sand. Walking north backwards, she unreeled the tape. At 100 meters she stopped and jabbed in more pins. After a brief dash barefooted into the ocean, Savage and Mazurek walked up and down the slope along the plot line, eyes scanning. Dried bull kelp. Dead bird. Driftwood. Broken crab and clam shells. Rocks. A perfect sand dollar. There, up on the dunes: a big, clear blue plastic water jug nestled amid some native dune grass. Savage began running to retrieve it before she remembered: This survey required leaving trash in its place. "It's so hard to leave it!" she said. In the end, the bottle was all they found that day. It had no markings on it; no way to tell if it came from Japan.